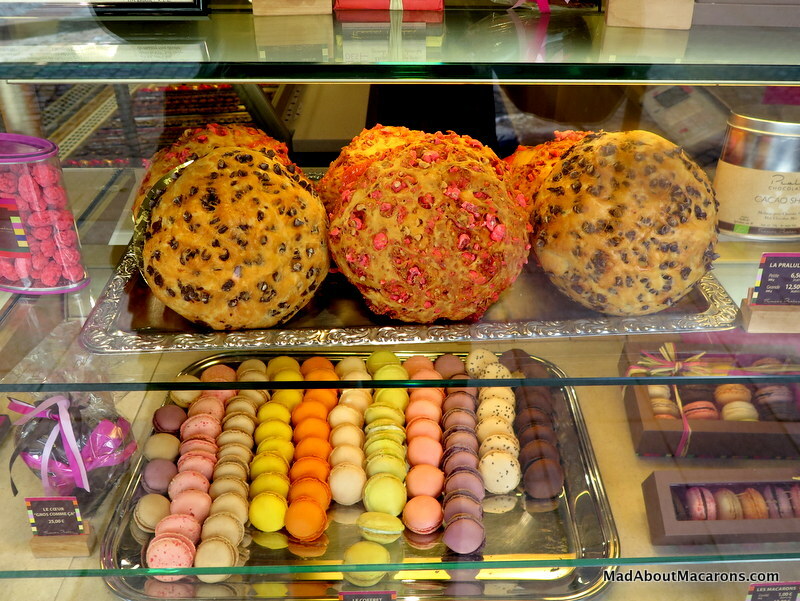 Now that you’ve had a tasting of some of Lyon’s best Bouchons and bistros in my last post, now it’s time to cover Lyon’s best patisseries, chocolate and macaron shops. What are Lyon’s Pink Pralines? 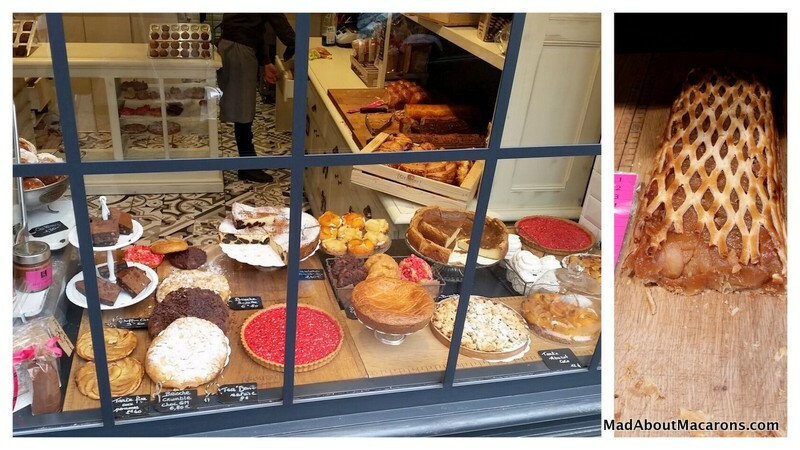 It doesn’t take long to discover Lyon’s most popular candy/confectionary speciality walking past the bakeries along the historic Rue Saint Jean in the old town and all around the city: sweetly welcoming windows are filled with bright pink pralines. Les Pralines roses are simply coated almonds in pink coloured sugar. Although you can eat them tel quel (as they are), they’re traditionally used in pink praline brioches or in the local tarts (Tartes aux pralines rose). With world-famous chocolate producer Valhrona only an hour’s drive south in Tain-l’Hermitage, it’s no surprise that Lyon’s chocolate shops are well covered (or well coated?). If you do have the chance to venture to Tain-l’Hermitage during your Lyon visit, then why not visit the Valhrona Cité du Chocolat and chocolate shop (there are tons of chocolates to try – each time my husband goes in I have to drag him out like a little boy!). And just around the corner you could finish up with wine-tastings at Chapoutier and Jaboulet, while you’re at it. Bernachon specialises in making their own chocolate from bean to bar and there are many other award-winning chocolatiers around, such as Philippe Bel, Bruno Saladino, Bernard Dufoux, to name a few. 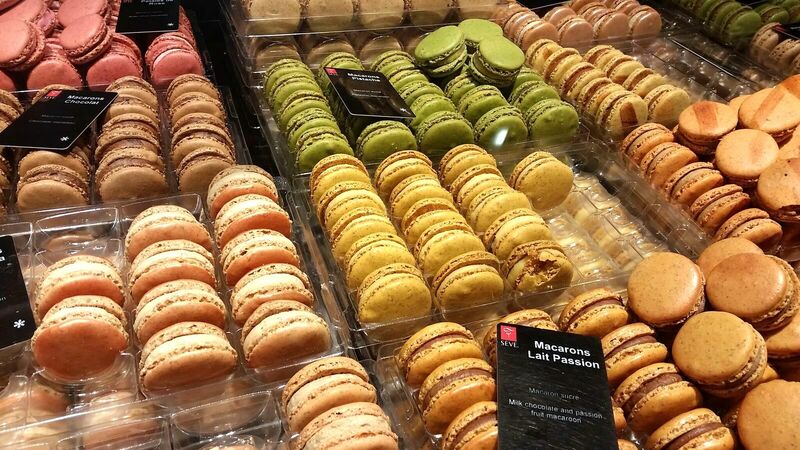 Richard Sève, award-winning chocolatier who makes chocolate from bean to bar, and pâtissier, was the first to come up with savoury macarons – something I am rather partial to myself (See chapter of savoury mini macaron recipes in my first book, Mad About Macarons). 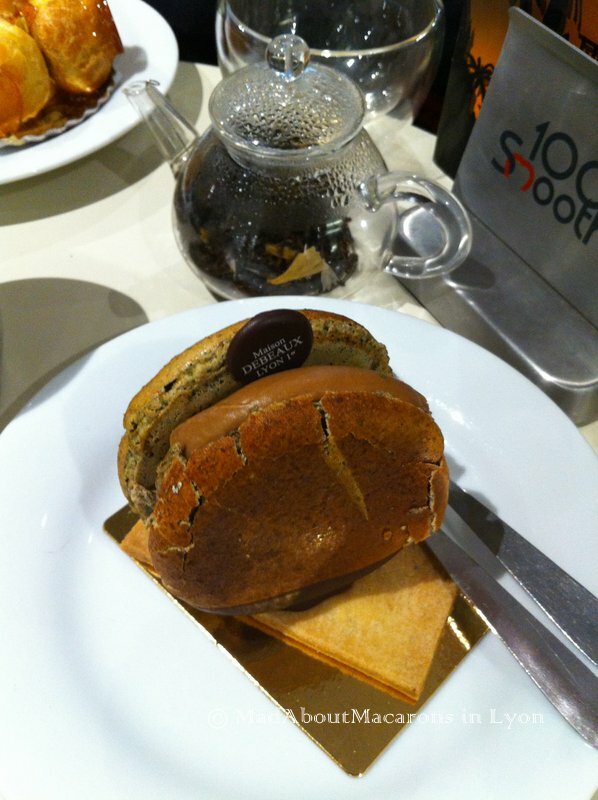 His first savoury macaron was with foie gras, a world first! I heard from him first hand, too, that he’s opening a new chocolate shop and museum (MUSCO) end of October 2017, so I’m looking forward to sharing this with you later. 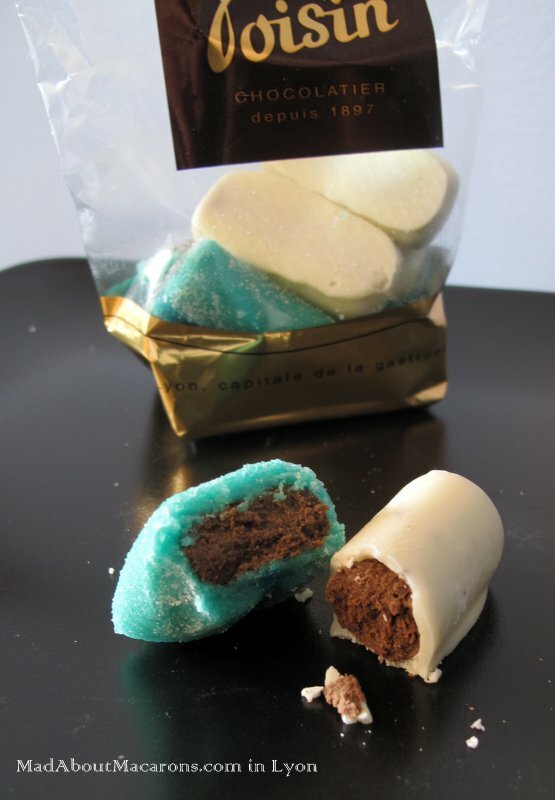 Since 1897, Voisin has been roasting not only chocolate beans but also coffee beans and are renowned for inventing the Coussin de Lyon, chocolate ganache covered in Curaçao marzipan, made a patrimonial French speciality in 1960. 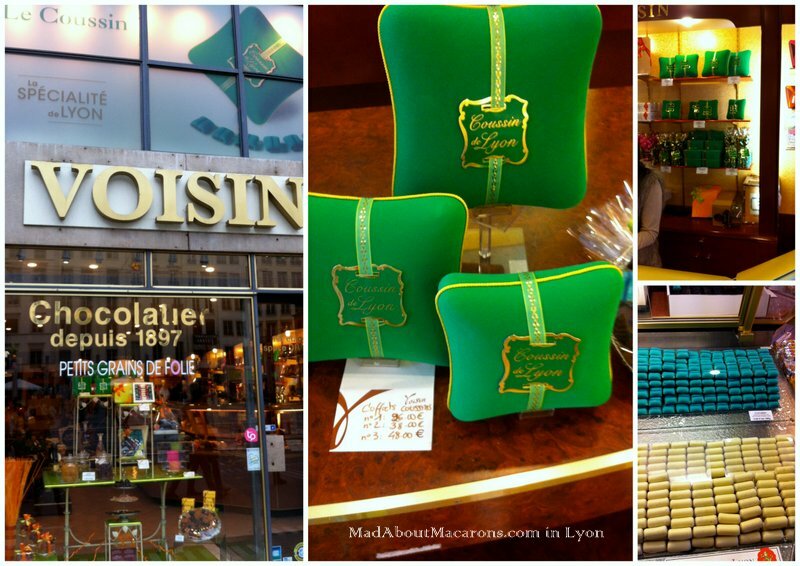 If you can’t get to Lyon, then you can still find them in Paris in speciality chocolate shops (e.g. De Neuville) and at Le Bonbon au Palais (they come in pink and purple as well as the traditional turquoise coussins), along with other Lyonnais confections, such as le Bouchon (a cork) and le Cocon, resembling a more delicious kind of silk worm, in homage to the famous Lyonnais silkworkers – more on my French regional confectionary post here. For delicious bread plus three varying types of the local doughnut-like speciality, bugnes lyonnaises, head to Ô Fournil des Artistes (next to the Maison de Canuts). 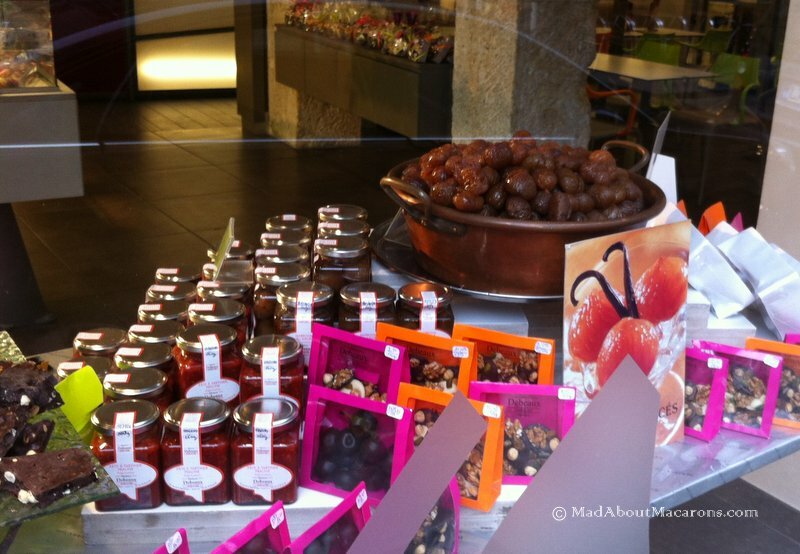 En route via the Grande Rue de la Croix-Rousse, try more pink pralines at Alain Rolancy, MOF. The family Maison Pignol, run by Meilleur Ouvrier de France, Jean-Paul Pignol, is a veritable gourmet oasis in such a gastronomic capital, covering traiteurs (delicatessens) to brasseries to restaurants – and his original love of traditional patisseries, from Paris-Brest to the Baba au Rhum. 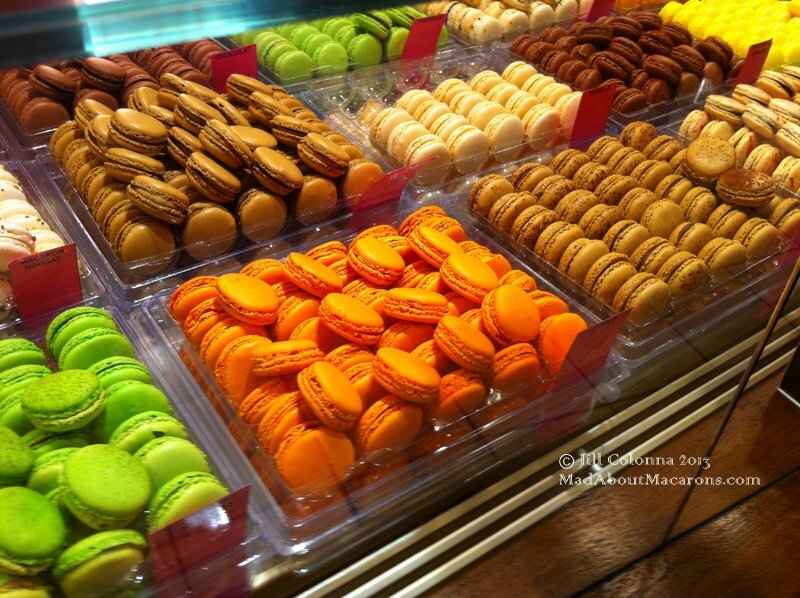 You’ll particularly love to stop at his patisserie in rue Emile Zola for a taste of macarons and 50 varieties of pastries and cakes. 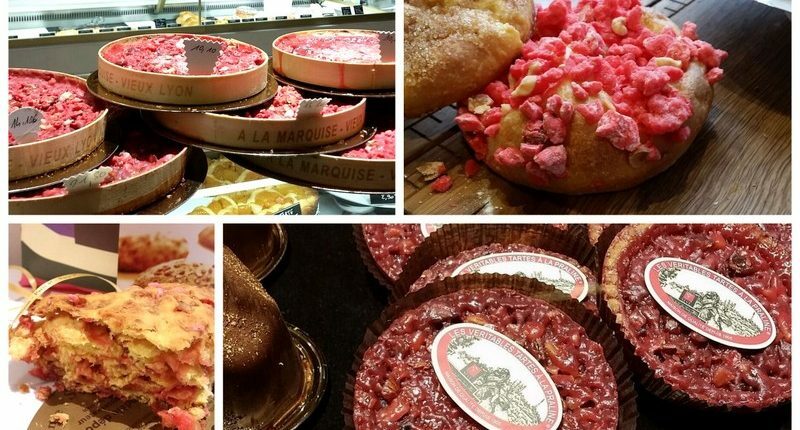 I shall be returning to Lyon since I can’t believe I missed his speciality, la Tarte Ecossaise (Scottish Tart)! 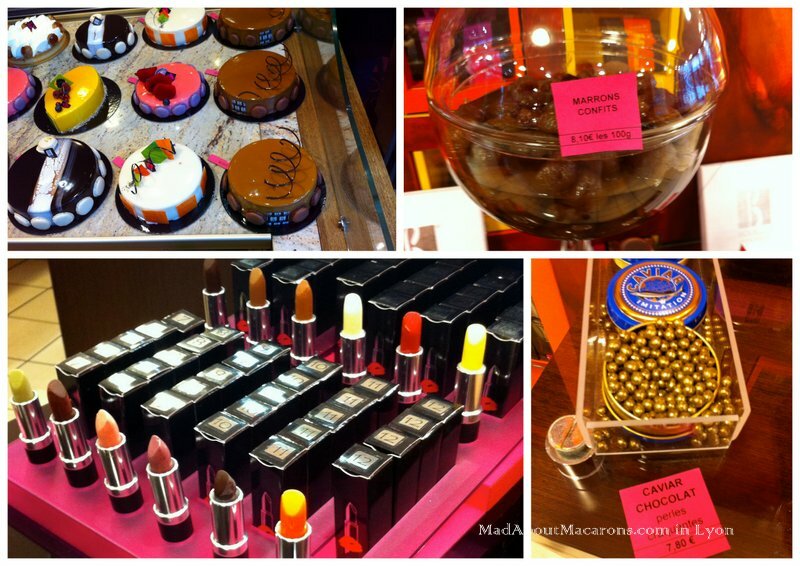 Just around the corner from the chocolate concept store Chokola (check out the mesmerising chocolate wall fountain), you’ll also see chocolate lipsticks, caviar, and the Maca’Lyon caramel macaron completely dipped in chocolate continuing at the legendary patisserie of Sébastien Bouillet (Place de la Croix-Rousse). I show this in more detail from my last trip. 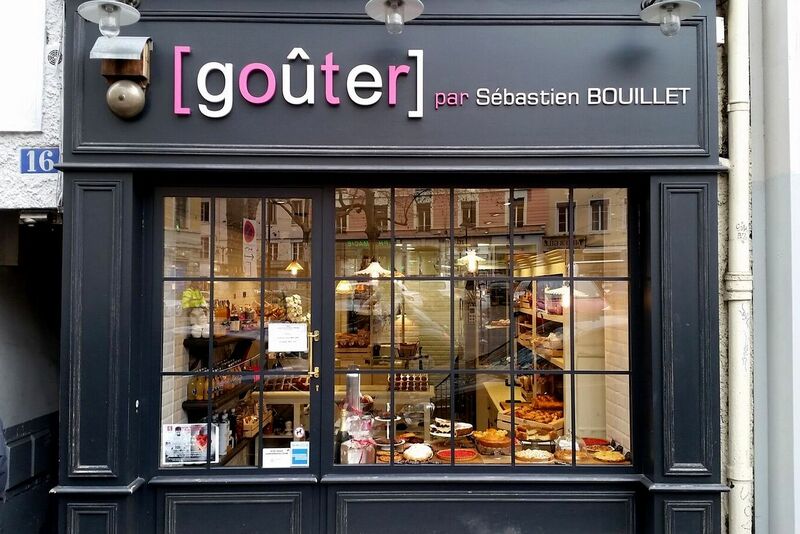 Moreover, to be totally Bouillet-ed, right next door is his new popular local bakery, Goûter. With echoes of yesteryear, such a charming window lures us in with cooling tarts and cakes winking at us behind the panes. Long cakes, a sausage-shaped tarte tatin and brioches are cut to size, as they’re sold by the length: imagine asking for half a meter of Tarte Tatin? As if that’s not enough, buttery financiers and scalloped madeleines tempt us further at the counter (recipes for these are in my latest book, Teatime in Paris). No gourmet Lyon trip can be complete without a taste of the famous Praluline invented by August Pralus in 1955. Today François Pralus continues to make this sumptuously sticky brioche, rising in another league, using almonds from Valence and Piémont hazelnuts to create the most compact pink praline buttery brioche in the city. 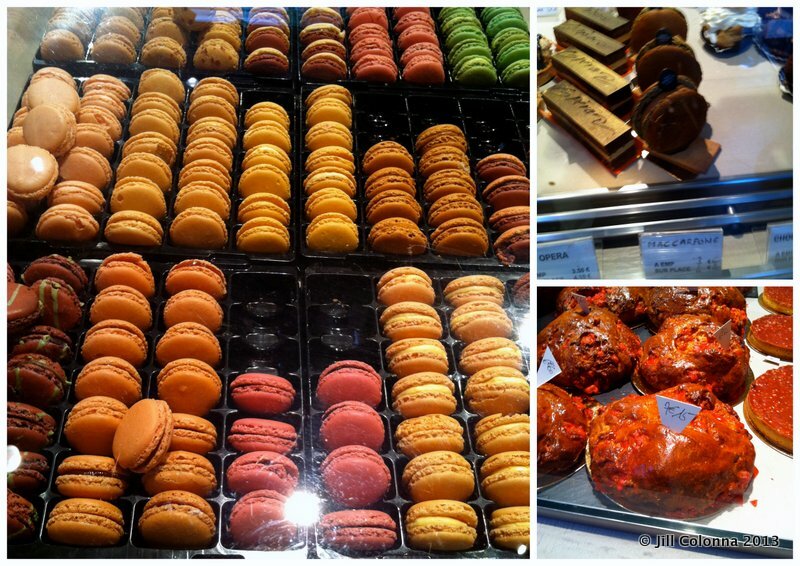 After working at Bernachon, François Pralus also makes his own chocolate from bean to bar – and macarons, of course! If relaxing in a tea salon is more your style, then a great tea list can be found in Rue de la République at La Maison Debeaux (OK, I admit to being seduced by the Kama Sutra!). 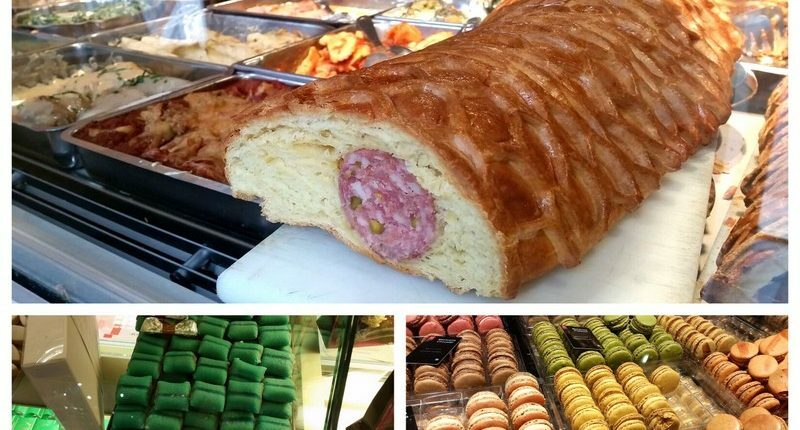 They also do a great saucisson brioché (typical regional sausage-filled brioche), as well as a whole counter of tempting salads and savouries. If you still haven’t had time to try pink pralines in any form, then you have no excuse, as their pinky goody selection would have Barbie in raptures. See my previous visit to Debeaux. Moreover, Anticafé (9 rue du bât d’Argent, near the Opéra) is worth checking out just around the corner from Debeaux for its catching new concept. At Anticafé (like its sister in Paris), you pay by the hour: so sit back and relax for 5 euros with free included beverages or drinks and nibbles while you work or meet-up and, although not advertised, they did tip me the wink that they don’t mind if you bring your own doggie-bag of pastries from local bakeries. After a taster of a selection, what would you choose? Three puzzled faces stared as I announced Lyon as our destination. While most French families take off to the ski slopes in the February mid-term school holidays, we chose our destination centred around food – driving 4 hours south of Paris to discover the best value gourmet Lyon in 3 days. Why Lyon? It may be the third largest city in France after Paris and Marseille but since 1930, it continues to earn its reputation as THE French Capital of gastronomy. Ever since the Romans originally settled here in 43BC (known as Lugdunam until the Middle Ages), Lyon has been a strategic crossroads between the North and South of Europe. Built around the Rhône and Saône rivers, it’s almost squashed together with its tall buildings to compensate for the two imposing Fourvière and Croix-Rousse hills. Historical echoes of commerce ring throughout the City, as we imagine crammed sailing boats vying for trades in wine, spices and especially local silk fabrics, an industry that has flourished since the 15th Century. We started with a visit to the Medieval Vieux Lyon, on the Rive Gauche (left bank), made up of Saint Georges, Saint Jean, and Saint Paul. Directly under the towering Fourvière Basilica, on a beautiful clear day the panoramic view of the city is (literally) breathtaking after the climb to the top. As Lyon’s Wintery February met us with wind and rain, we’ll leave that for our next visit. Museums were our answer, such as the Musée Miniature et Cinéma which shows props, realistic miniatures and special effects; and the Guignol Workshop Theatre, which not only highlights Lyon as the birthplace in 1808 of the Guignol puppets (much like Punch & Judy) but Damien Wels is the only Meilleur Ouvrier de France (best craftsman) in this domaine as sculptor and puppet-maker. If you’re like me and fascinated by historical French doors, you’re in for a treat. Behind many of them are secret passageways, called Traboules. The Traboules in Lyon are unique in the world and date back to the Renaissance. 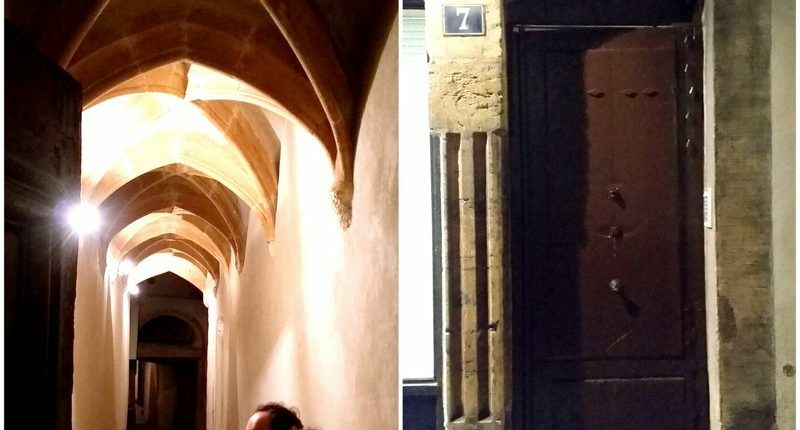 Coming from the Latin for “passing through”, there are 350 of these secret narrow passages in the city. 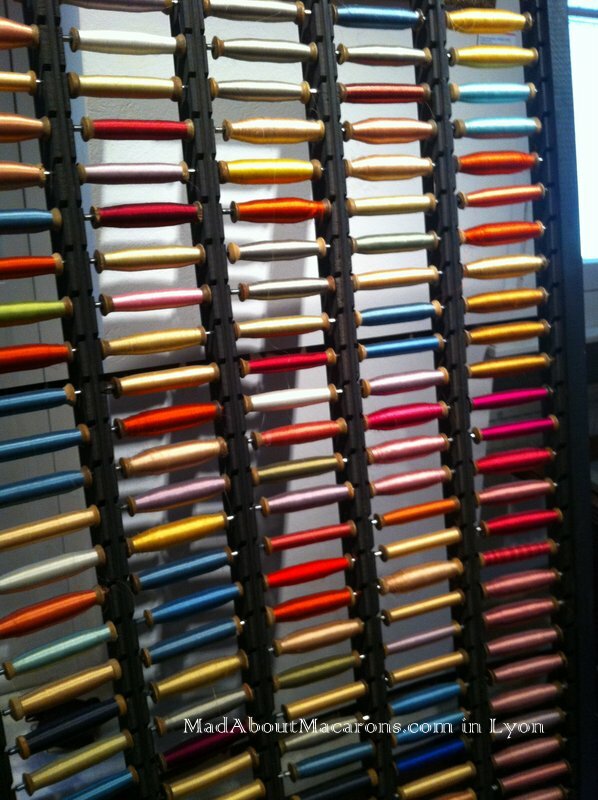 They were created as direct paths for the local silk workers (les Canuts) to transport their fabrics protected from the rain – so to avoid weaving in and out (sorry, can never resist an opportunity for a terrible pun) between their workshops and the crowded streets. Like any of the locals, our friend, Jean-Paul who owns a gorgeous little gift shop in Rue Saint Jean, is familiar with the traboules. There are 24 of them in Rue Saint Jean alone! He led us to Number 7 as a short-cut to get to our restaurant that night: instead of walking around a couple of maze-like streets, we were directly led to Number 7 right on the Quai Romain Rolland. It was our first experience of trabouling – yes, apparently it’s a French verb, to Traboule: so, j’ai traboulé! Avez-vous traboulez? For a better idea of Lyon’s main industry, we headed up the “hill that worked” of the Croix-Rousse to visit the silk weavers’ museum. The Maison des Canuts (rue d’Ivry) demonstrates how silk was made using Jacquard looms and depicts the deplorable living and working conditions (the workplace was also their living quarters), leading to many uprisings from the 1830s, also penned in Hugo’s “Les Misérables”. To get to the museum, we walked from our hotel – assured by Antoine that it was “just up the road”. Up was the word, bracing the steep pente or hill of La Montée de la Rochette to the Croix-Rousse plateau (note the lovely word plateau when you get to the top!) If you have a step-tracking app or bracelet, you’ll be proud of such a condensed 10-minute climb to merit a taste of the local specialities! The good news is that there are plenty of wonderful bakeries in the neighbourhood to satisfy your savoury or sweet tooth. 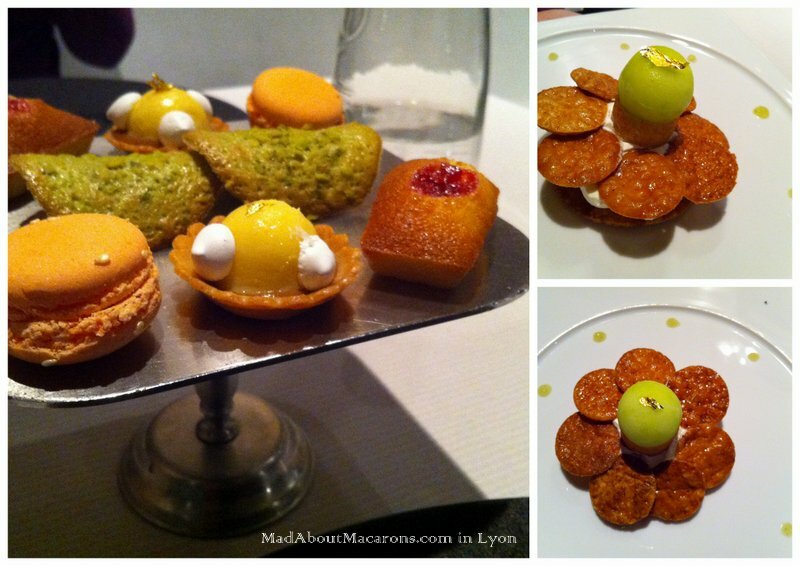 There are so many, I’m preparing a separate post, JUST on the sweet side of Lyon – coming next. 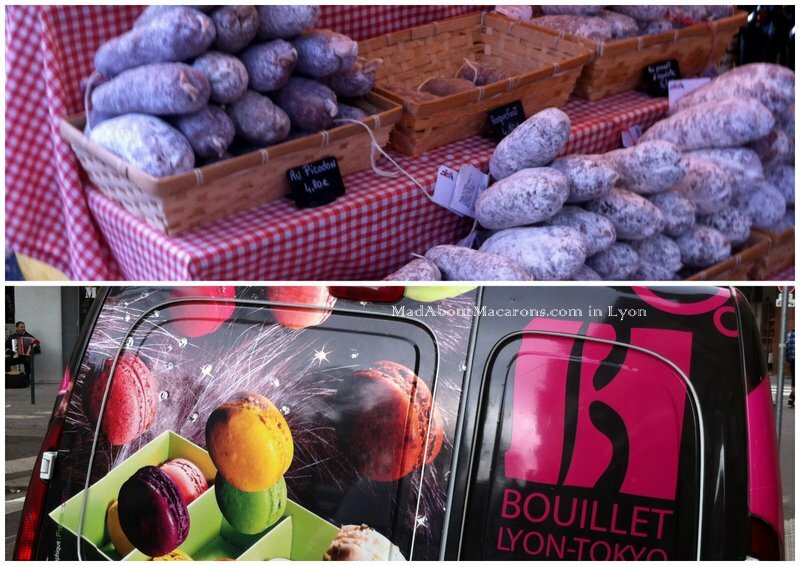 What are the Bouchons Lyonnais? Most important are Lyon’s restaurants, of which the lively Bouchons Lyonnais are famous worldwide for the local cuisine and friendly ambience. Catering initially to the early-rising exhausted silk workers with a Mâchon Lyonnaise (8-10am) around a hearty pre-lunch meal mainly of tripe, the bouchons arrived thanks to the Mères Lyonnaises in the early 20th Century. These strong-willed “mothers” created their own restaurants or bouchons serving “simple yet refined” cuisine at a time when the bourgeois families they worked for could no longer afford to keep them, especially after World War I. La Mère Fillioux was the first to gain a reputation for her cooking; La Mère Brazier went on later to learn Mme Fillioux’s culinary tricks, popularising her Poularde de Bresse Demi-Deuil (truffles lined under the chicken skin). Mère Brazier then opened a second restaurant, passing on her tricks to a certain legendary Lyonnais chef Paul Bocuse. Moreover, in 1933 she was the first woman to be awarded THREE Michelin stars – and simultaneously for both restaurants! A traditional bouchon is a cosy, welcoming home-from-home, almost as if sitting in someone’s own dining room filled with memorabilia, trinkets – many decorated with Guignol puppets. Wine is good quality, even if served in simple pots (small bottles) with mainly Beaujolais or Côtes du Rhône. The food is real terroir (local cooking from-the-land) using quality products. If you love pork and bacon, you’re in for a bonus treat. 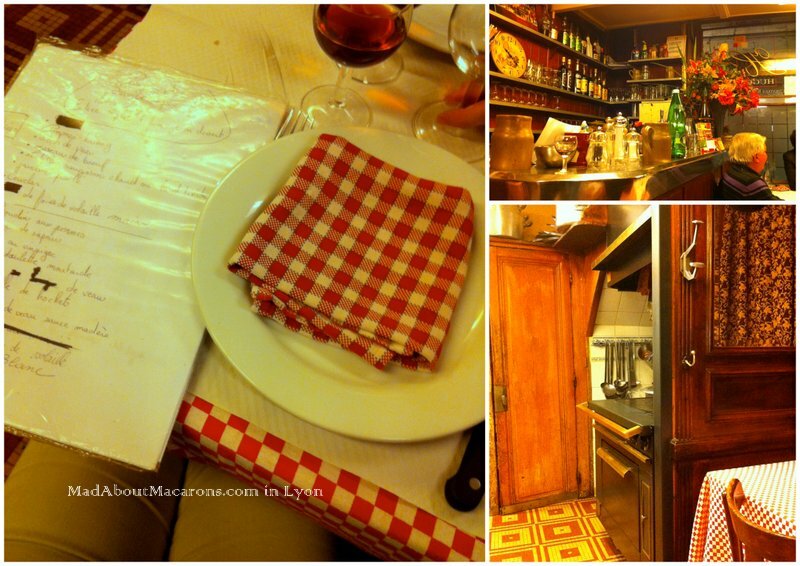 On my previous trip to Lyon, I headed for Chez Hugon. This time we tried out two more – of which Chabert & Fils (11 rue des Marronniers; open on Mondays) was our favourite: a real down-to-earth, jolly evening around an exquisite, typical kind of menu. Typical entrées (first course, starter) include saucisson sausages or the popular sausisson brioché with salad (lettuce leaves), Salade Lyonnaise (lettuce, bacon, croutons and more); I pounced on my absolute local Bourgogne favourite Oeufs en Meurette (photo above: poached eggs cooked in Burgundy red wine, onions and topped with croutons). The most typical main dish (plat) is the Quenelle, formed into a sausage shape but made with bread and either chicken or veal, but the most proposed is the Quenelle de Brochet, made of pike and served in a Nantua sauce. It looks pretty dense but you’ll be surprised how airy it is. Dessert usually comes in some kind of pink form, with Pralines Roses as main feature: from Tarte aux Pralines, with a sticky pink garniture of pralines roses melted with cream. But the real classics that were served by the Mères Lyonnais were good old French tarte aux pommes, île flottante (floating meringue in vanilla custard), and a boozy Rum Baba – even if this was invented by Stohrer in Paris but when booze is concerned, I’m not complaining. Lyon’s traditional bouchons aren’t the only great restaurants in town. There are many discrete Michelin-starred establishments around, with Paul Bocuse the ultimate star. This time we wanted to try smaller bistro-style addresses with up-and-coming young chefs. These are excellent value for money – but note that they offer LIMITED CHOICE MENUS. Smaller menus are perhaps not suited for particularly fussy eaters but it’s fun to try dishes you wouldn’t normally think of ordering, if you’re open to new tastes and ideas. Do remember we were only here for 3 days and so we need to return to try out more to complete the list! Young chef Grégoire Baratier was recently awarded “Les Toques Blanches Lyonnaises 2017” amongst an impressive line-up of around 50 like-minded creative chefs and Meilleurs Ouvriers de France just in Lyon alone. Although he learned the ropes from local chefs such as Paul Bocuse and Anne-Sophie Pic, his cuisine bursts with his own personal style. Seating is limited to a cosy 40 covers so booking is essential. 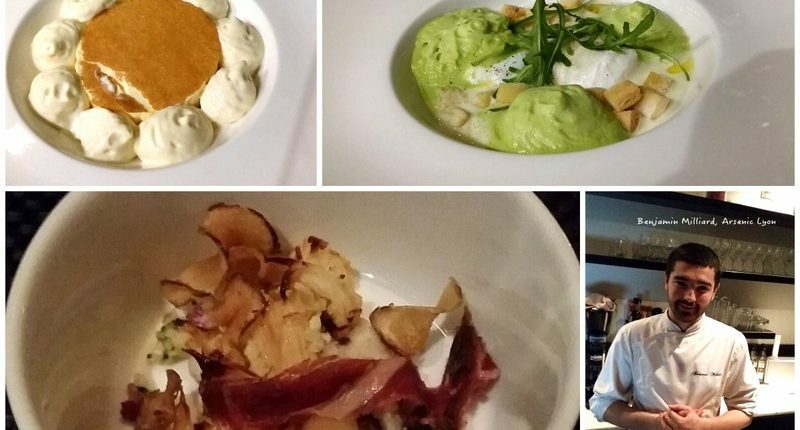 I went for the 29 euro evening menu of starter, main and dessert – although confess to stealing tasting part of Antoine’s beautiful local Marcellin fromage plate too from his 4-course menu. A helpful bonus was an accompanying list of allergens of each menu item. Don’t miss the signature dessert: an iced vin jaune parfait, topped with crackling brûlée and surrounded by a light cèpe mousse. Yes, you heard me, mushrooms for dessert? Don’t worry, it’s so subtle yet intriguing. Arsenic (132 rue Pierre Corneille, Lyon) didn’t initially convince us by its name, somehow. We were imagining all sorts of weird and wonderful dangerous potions appearing at the table, smoking through bowls under some molecular gastronomy spell. Instead, Arsenic is more of a concept that highlights the latest talents of young chefs making waves in Lyon’s gourmet world. Having gone through the ranks with Christian Têtedoie (Meilleur Ouvrier de France – read my review of his restaurant here), we loved the surprising dishes from Benjamin Milliard when we visited – even the amuse-bouche of cauliflower and Jerusalem artichokes was sublime. Cod and pear? Why not? He pairs them both beautifully too. With a great wine list, there’s some good value for money treats too. This was our last stop to stock up the car with local goodies before our drive back to Paris. 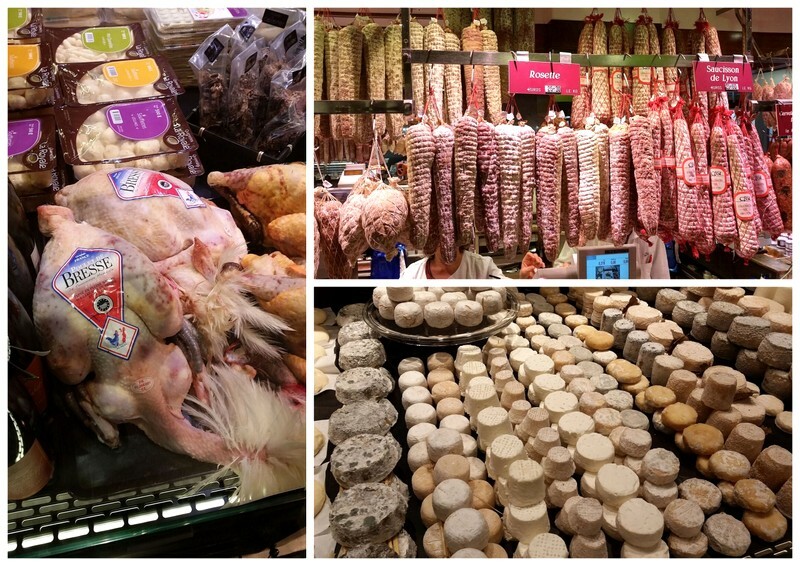 There are 40 markets in Lyon but you can’t come to the gastronomic French capital without a visit to Les Halles de Lyon – Paul Bocuse. It’s the crème de la crème of best producers under one roof, highlighting local specialities from charcuterie, pâtés, poulet Bresse free-range chickens, and rows and rows of cheese; freshwater fish and quenelles; to chocolate, bonbons and patisseries from the finest Lyonnais pastry chefs and chocolate makers. Don’t despair if you don’t have room to bring anything home: stop for a bite at one of the welcoming stalls for a plate of oysters or quenelles. Where to stay in Lyon? We stayed at the Hotel Metropole. Although many reviews say that it’s a bit out of town (Caluire-et-Cuir), we found it so easy just to jump on a 40 bus that whisks you into the centre of town (Bellecour) in about 15 minutes. Tickets can be purchased directly from the driver or better still, buy a carnet of tickets at any metro station in the centre of town. By renting a couple of studios for 2, we purposely didn’t have breakfast at the hotel, so we were free agents to organise breakfast with traditional treats from Lyon’s best bakeries and pastry shops. Speaking of which, watch out for my next post on this sweet subject, as this merits its very own write-up! Now the family are asking to return, especially as we didn’t have a taste of the “local” brasserie near the hotel, none other than Paul Bocuse’s Fond Rose. It’s a lovely proverbial carrot to leave them on, don’t you think? This post was not sponsored in any way. After writing this earlier this year, a UK magazine wanted to publish it this Autumn but has not gone to print since my images were not good enough, taken on a simple telephone. So, here it is finally for you to enjoy free on le blog, without the glossy fancy images. Well that took forever to post something: my kids are suddenly using this computer so much for their homework that my minutes are counted! Where was I? Ah yes, my weekend in Lyon: it was a real treat. 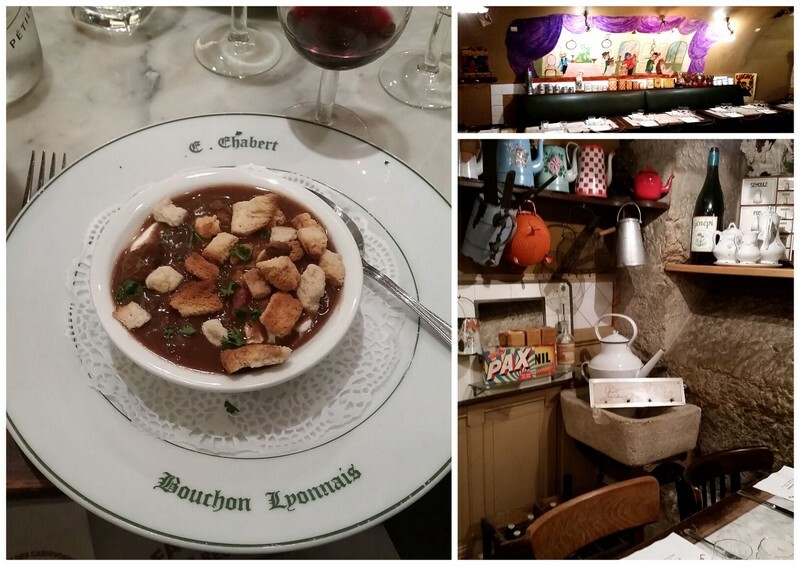 After experiencing Chez Hugon, a fabulously friendly Lyonnais bouchon with its traditional sausages, poulet au vinaigre and quenelles de brochet, it was time to venture out next day to discover Lyon’s sweet side. No trip to Lyon is complete without visiting Sebastien Bouillet. I’d already seen his chocolate and macaron artistry at the Salon du Chocolat in Paris and had previously heard of his ‘MacaLyon‘, which provided inspiration for a half-dipped macaron in chocolate which is in the book. First – since we wanted a girlie weekend with a bit of culture thrown in too – we headed to La Maison des Canuts. The Canuts were the Lyonnais silk weavers who mainly worked in this hilly area of the Croix Rousse. 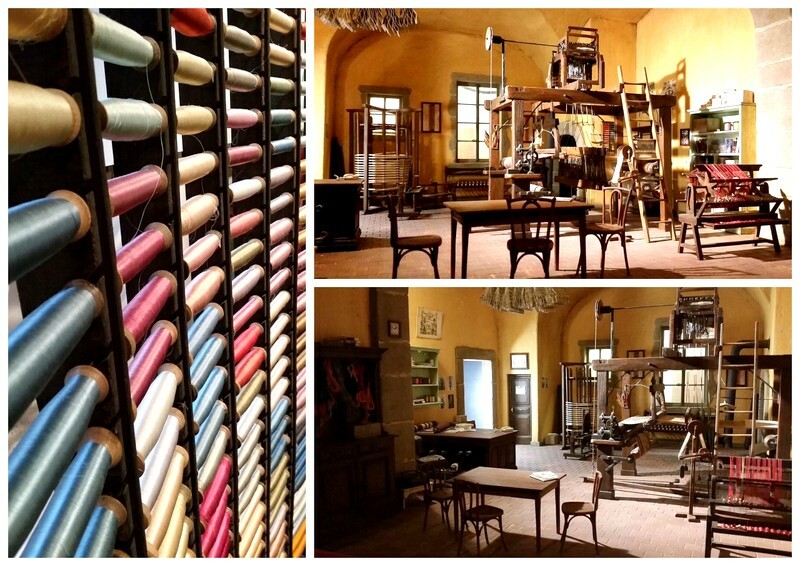 The museum takes about 50 minutes to visit (if you do the guided tour in French) otherwise you can stroll around willy nilly while you’re left imagining the poor conditions these weavers had to work in, as if out of a scene of Victor Hugo’s Les Misérables. Sebastien Bouillet is only a ten minute walk away from the museum to the market square, at Place de la Croix-Rousse. With the bellowing of an accordion nearby to get us into the French pâtisserie spirit, the boutique’s front was more like a make-up stand in a Parfumerie. 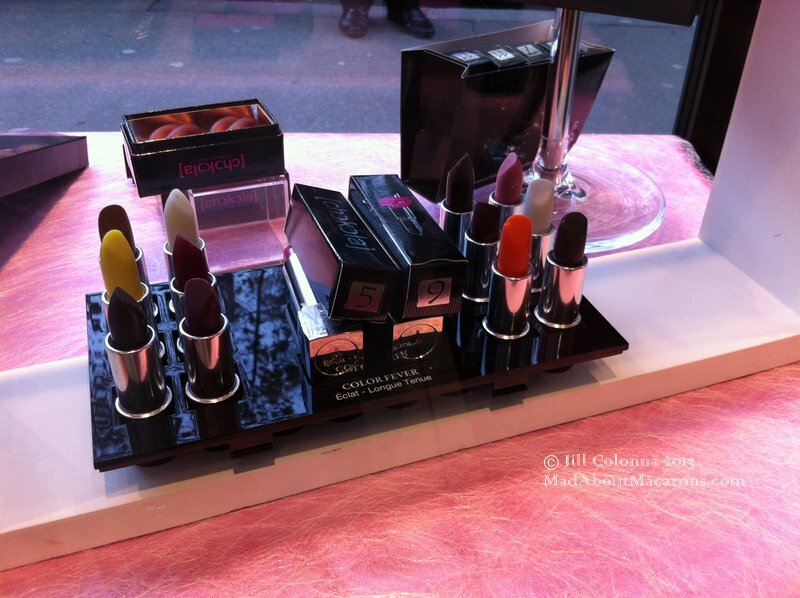 Don’t be fooled: these are chocolate lipsticks from his ‘Chokola’ collection! What about some lip-smacking milk chocolate and passion fruit to hide in a handbag along with some chocolate lips, chocolate caviar… and some candied chestnuts (perhaps the latter would be messy)? His pastries were so inviting and at a fraction of the cost of the same kind of elegant, creative combinations you find in Paris. 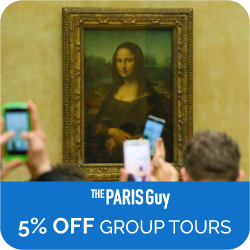 With only a 2 hour ride from Paris Gare de Lyon (surprise! ), I need to pop on that TGV train more often. 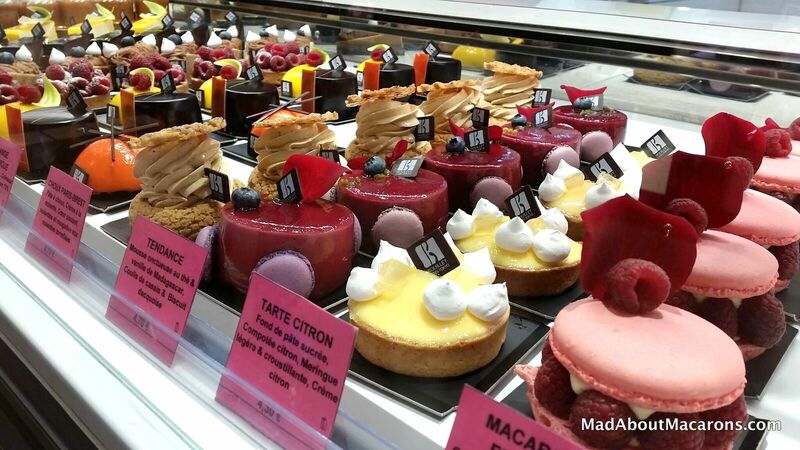 He also runs a prestigious pastry school, Gâteau Ecole. His colourful array of macarons are just as tempting with inspiring flavours such as quince, chestnut, gianduja with green tea, chocolate, praline, salted caramel…. what would you choose? Another culture break down the hill is well worth the visit to the Musée des Beaux-Arts, the second biggest art gallery in France after the Louvre. 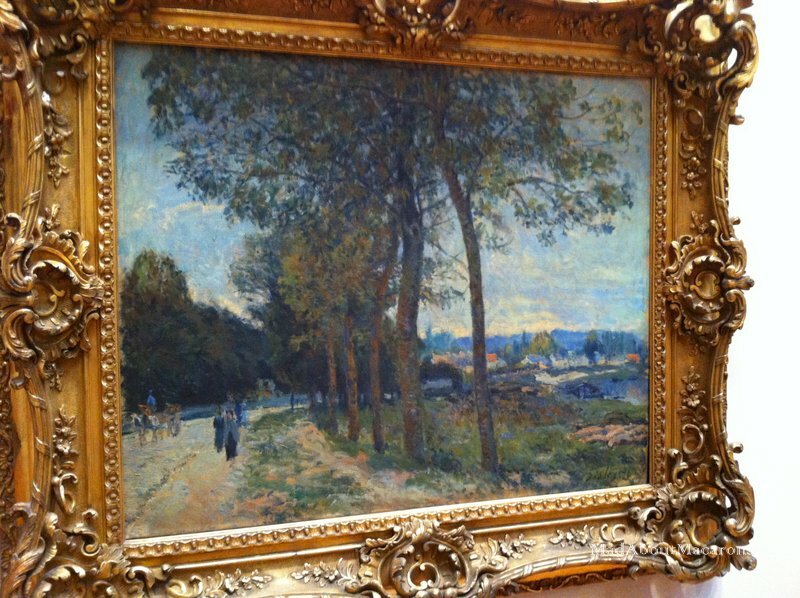 I love seeing the impressionists paintings of scenes taken along the river Seine. This Sisley landscape is just up the road from us, in Marly-le-Roi. Nothing much has changed. Just next door to the Gallery is a welcome sweet neighbour, Chocolatier Voisin. Léon Voisin’s chocolate shop’s doors have been open since 1897. 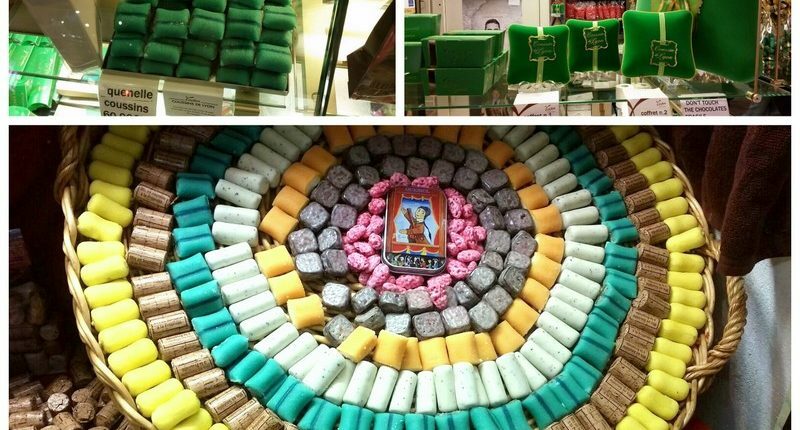 He created the Lyon speciality, Le Coussin de Lyon: a bright green cushion of chocolate ganache, almond paste and a hint of Curaçao. If you love marzipan like I do, this is a must! The friendly staff at the art gallery told us to try Voisin’s delicious praline quenelles. They’re officially classed as a national delicacy as the patrimoine nationale de la confiserie. Again nutty, they’re made with grilled hazelnuts and almonds and covered in white chocolate. I felt like a bit of Opera coming on but we’d missed the guided tour (Saturdays at 1pm) so instead we headed to rue de la République. Or rather, we tried to. What is it with these Smartphone map apps? I always get lost with them. 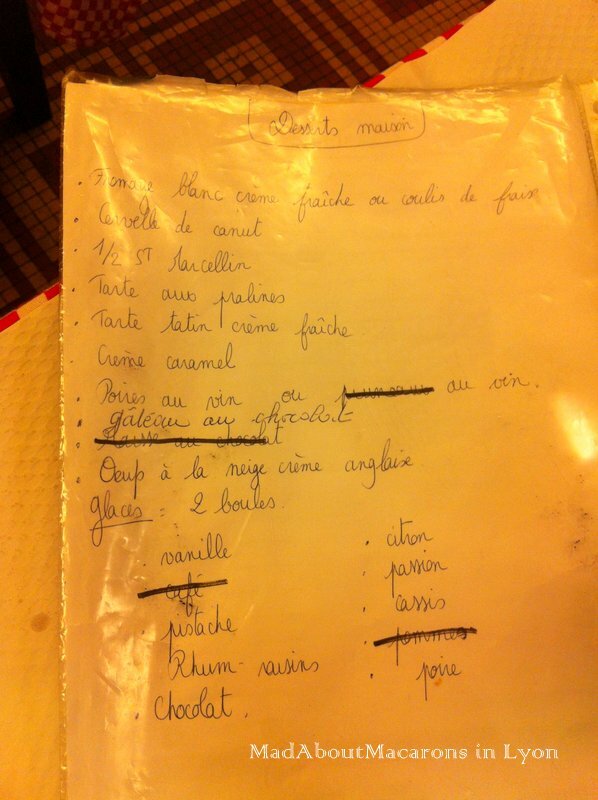 Instead, we found it the old-fashioned way by asking a friendly Lyonnaise the direction. Walking in Lyon is like being in Glasgow but chatting in French: the Lyonnais are so friendly they even ask where you’re heading and how they can help. It’s a long way from Paris! 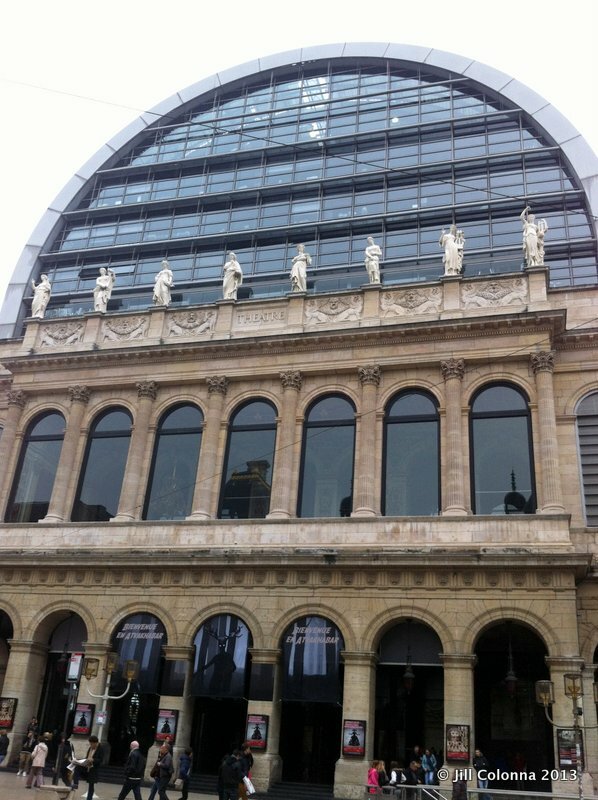 At 4 o’clock, it was time for another kind of Opéra, with a cup of tea. Bingo! 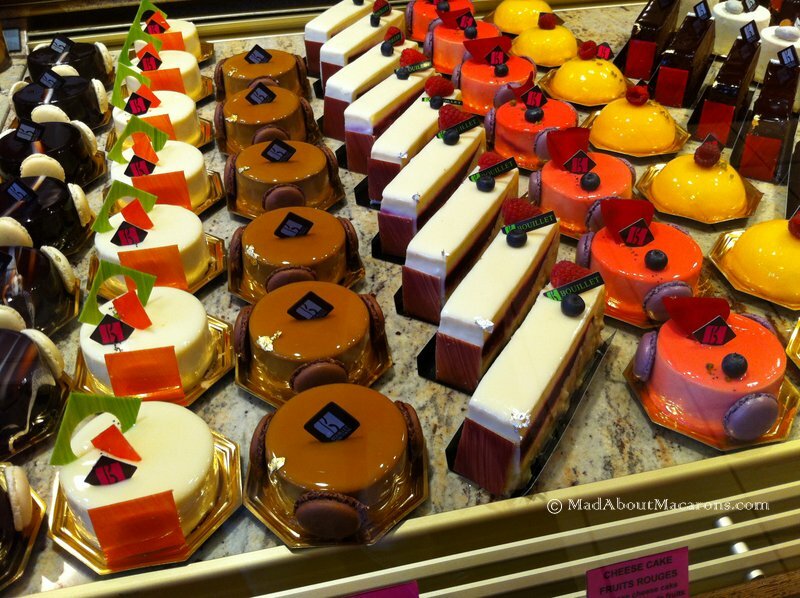 We found our recommended Salon de Thé or tea salon at La Maison Debeaux. Their traditional pink praline tart and brioches were tempting enough but I surprised even myself by pouncing on a giant coffee macaron with mascarpone cream, the ‘Maccarpone‘. Well, macarons are gluten free, after all. Our particularly adorable server, on the other hand, wasn’t quite in agreement with my tea order: I’d asked for one of their gastronomic teas with a petit nuage or cloud of milk. But Madame, this kind of tea shouldn’t be taken with milk. Instead he brought me some Earl Grey, or Thé à la Bergamote, and offered me the most dinkiest looking teapots filled with blue flower and jasmine tea, just for me to try. Now that was class in a glass teapot. I missed my milk, though! When most gastronomes think of Lyon, they think of Paul Bocuse. This time around I wanted to try the Tetedoie restaurant, run by the brilliant chef and President of the Maîtres Cuisiners de France, Christian Tetedoie. His menu, Découverte et Gourmandise, merits a post by itself but a glimpse of his sweet treats will hopefully give you an idea why I’d love to return. This sublime dessert, caramelised pastry with green apple compôte and Granny Smith sorbet was light enough to enjoy his surprise plate of mignardises to finish off the evening – all with the most spectacular views of Lyon. It was the cherry on the cake – or meringue on the macaron? – of the weekend. Soon it’s Lyon’s annual festival, la Fête des Lumières (5-9 December – check out their fun video on this site). 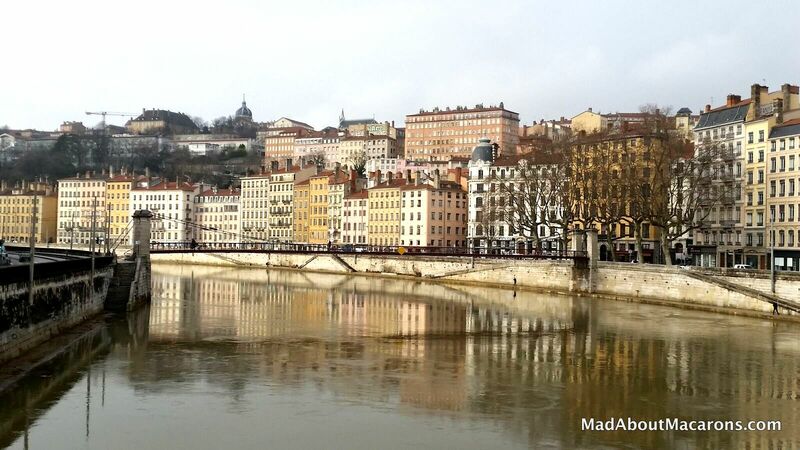 Next year we’ll need to organise another trip and discover more of Lyon’s sweet side. What do you think? Disclaimer: All tastings and financial indulgences were purely my own. Ridiculous! When I met my journalist friend, Ann Mah, for a chocolat chaud and macarons in Paris this summer, she was radiant with the prospect of ‘twins’ on the horizon: a baby girl soon to be born in New York and her new book, Mastering the Art of French Eating, which has just recently been published by Penguin Viking. Had I known Ann at the time, all alone in Paris for a year as a diplomat’s wife – not unlike Julia Child, as the title suggests – while her husband was assigned a post in Iraq, I would have loved to have joined her. You see, in order to combat loneliness in the City of Light (and I know what that’s like at first – not easy), she embarked on a gastronomic adventure around Paris and the rest of France. As David Lebovitz says on the back cover, “Her personal culinary tale will have you packing your bags”. I didn’t think that before I’d even got to the Salade Lyonnaise recipe at the end of Chapter 4, I would have booked a weekend in Lyon! It was about time, after a long haul of being stuck in the house with back problems and builders. Besides, in over twenty years I’ve lived here, I’ve only passed through Lyon en route to visit my French parents-in-law in Provence. As France’s gastronomic capital, how could I have just gone through its tunnels under the Saône and Rhône? 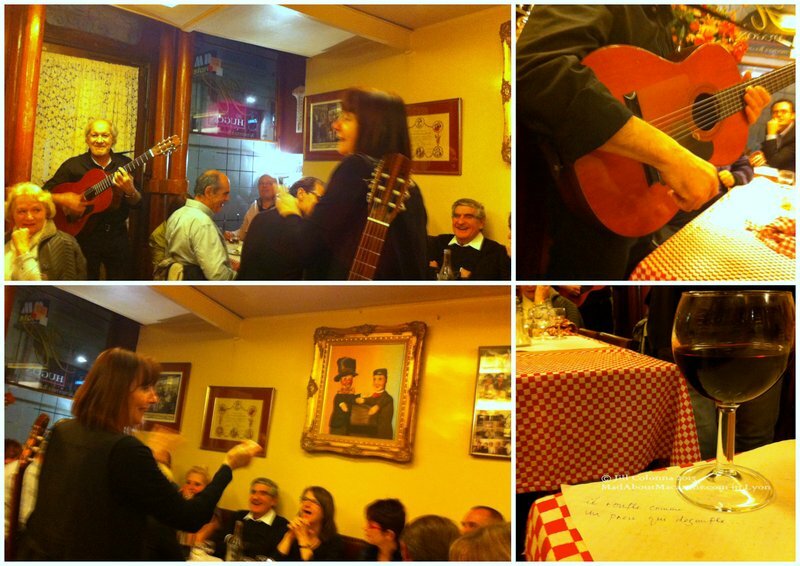 One of Ann’s favourite addresses in Lyon is a typical bouchon eatery, Chez Hugon. I’m not going to give you all the gastronomic history here, as she beautifully documents it in her book but, as a first introduction to Lyon, I can tell you the ambience was contagiously uplifting. Opening the Bouchon door and seeing the long, communal packed tables with diners in full conversational swing, one diner must have seen my panic-stricken face at the lack of space. ‘Mais, you’re too late – there are no seats left’, he teased. Sensing the Lyonnais sense of humour, just as his friend got up to go to the toilet, I grabbed his seat. Luckily, two wooden chairs were waiting for my friend and I at the end of a table, just cosily next to the kitchen, so we could relish the lively banter from both sides of the restaurant. As an ex-vegetarian, I didn’t quite make it to the traditional Andouillette tripe sausage but instead went for the lentils with bacon and a Quenelle de brochet, just as Ann had tasted, “served in a puddle of langoustine sauce”. Suddenly the chef, Eric, joined his mother in the front and burst into full song, with “Mexico, M – e – x – i – c – o…. 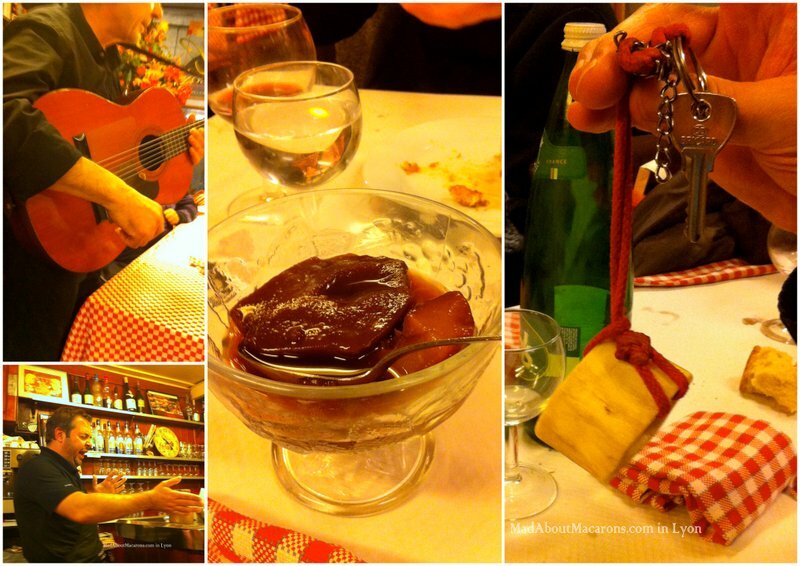 !” As I downed another glass of Fleury wine (one of my preferred Beaujolais Crus which I prefer on a day like today) accompanied by pears in wine (when in Lyon…), the neighbour at my table was handed the key to the toilet; on a marrow bone. 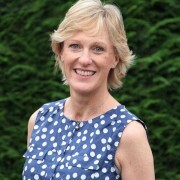 Ann hopes that readers of her book feel encouraged to travel and explore, to ask lots of questions, to embrace their curiosity and be flexible and open to new experiences. Well, Ann, chapeau to you! I’ll definitely be returning to Lyon to discover more traditional bouchon eateries and join in the friendly banter. With ten chapter/regions in the book, from Paris to l’Aveyron, you’ll be ready to pack your bags for a delicious adventure, too. 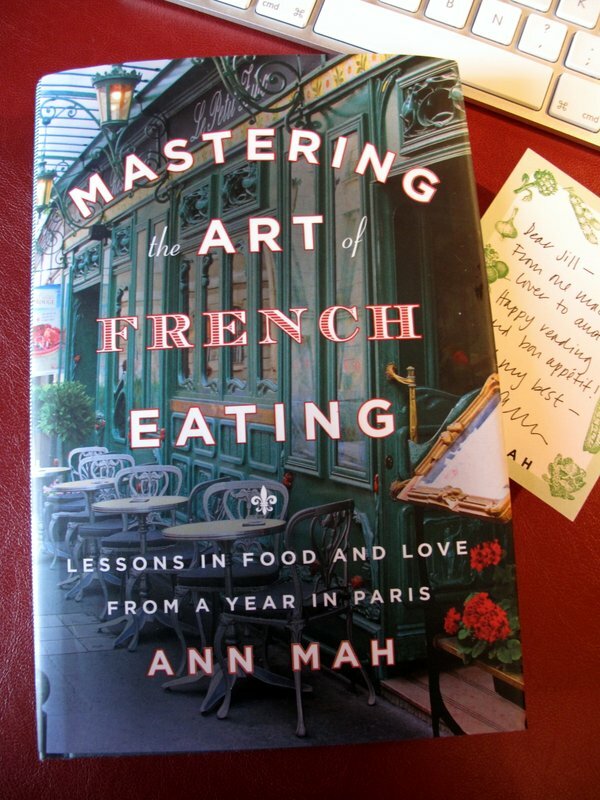 Don’t forget to devour a copy of Ann Mah’s book, Mastering the Art of French Eating: Lessons in Food and Love from a Year in Paris. 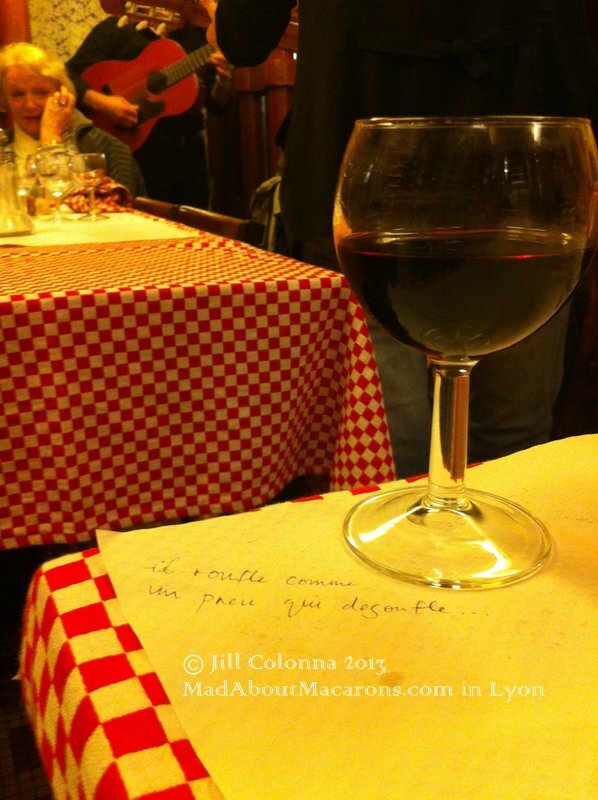 As a companion to her book, Ann is currently posting a series on her blog, ‘Where to Eat in France‘. Traditionally today, on the third Thursday of November, let’s give a toast to Beaujolais Nouveau Day! Chez Hugon is usually open Mondays to Fridays but, exceptionally this weekend, they’re open to celebrate with a few pots of Beaujolais Nouveau. P.S. Have you tried my favourite caramelised red onion tarte tatin recipe yet?